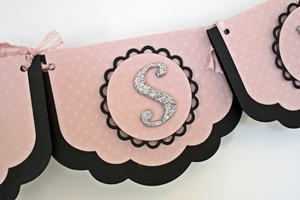 The new Spellbinder dies have arrived, and what a fantastic range of designs on offer. Today I have a card I made to share with you. 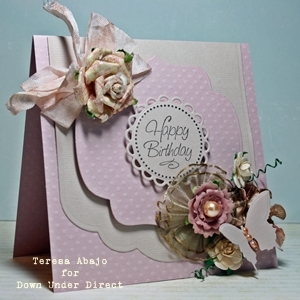 For this card I have used two of the new Spellbinder Dies- Grand Peony Creations and Lace Doily Accents. Good morning all. Today we have another Father's day project to share with you. Be sure to check back often, as from tomorrow we will be featuring a month of projects using the new release Spellbinder Dies. The Design Team has been busy creating some fabulous new projects that are sure to inspire. Today we have another layout to share with you. Today we have a lovely card from Teresa. 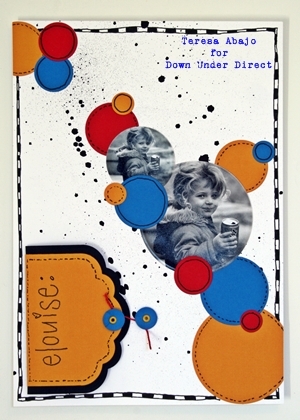 JB08790 Just A Note Borders & Centres 1 5/8"
Father's Day is only a week away, so today we have a gift idea for dad. A set of coasters made using the Spellbinder Die Sprightly Sprockets. Here is a layout that shows you how you can use your scraps to make paper rolls, a great dimensional accent. The back ground is white carstock painted with a H2O wash, highlighting how versatile Bazzill cardstock can be. With Father's Day just around the corner, here is a masculine themed page for you today. It's Tutorial Tuesday time once again. 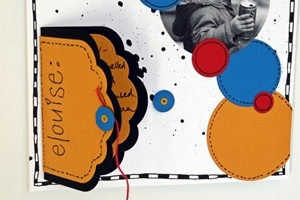 Today's tutorial is for making a three panel card using Labels Eighteen. This technique produces a three panel card that is in one continuous piece. This technique could also be used to make a fold out feature on a scrapbook page. Fold and crease one end of a piece of cardstock, making sure the area between the edge of the paper and the fold is slightly larger than your chosen die. Place the paper and die onto the base cutting plate so the non folded side is just hanging over the edge of the base plate. 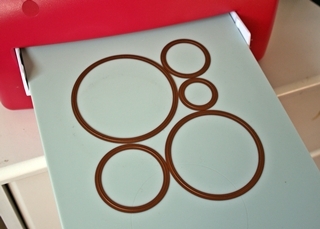 Place the top cutting plate on top and run through your die cutting machine. Cut away excess paper. This is how it will look once it is cut. Carefully fold and crease the cardstock so that tghe folded edge is just inside the cutting line. You shouldn't need to reposition the die at this stage. Place the paper and die onto the base cutting plate so the non folded side is just hanging over the edge of the base plate. See first photo below. Place the top cutting pad on this and run through the cutting machine. Remove the die and repeat on the other side. You should now have a three panel card to decorate as you like. The flower on the front of my card is made using Floral Doily Motifs. You can find the tutorial to make this here. Here is a pretty layout from Teresa. 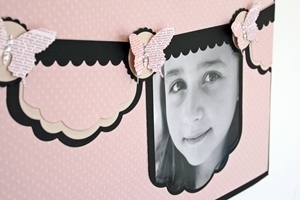 This is a banner made with the Grand Labels 11 dies. I folded the die cuts in half, punched holes in them at the top, and joined them with hand-dyedscrunched seam binding. The alpha stickers were altered with some silverglitter to match the cardstock and give the project a little sparkle. Today we have a masculine themed card from Sheree. On this layout Sue has used a plain colour and altered it, with sprays of glimmer mist, she has even used a large butterfly in the lower right hand corner as a stencil, (though it is mostly covered) to give the illusion of patterned paper. Adding the elegant posts the same colour as the background on the edges of the photo give it depth The organza leaves are cut out with the Spellbinders too. Today we have a Thank you card from Kirsty. Don't forget to add a little extra WOW to your cards by decorating the inside! Roses made with the Rose Creations, make any Off The Page project unique, they can be any colour you choose in the Bazzill range. Here the elegant posts are used to make a trellis for the flowers. The spellbinders can be used to cut leaves from materials that are altered to make the gorgeous glittery leaves. Look out for a tutorial on that. 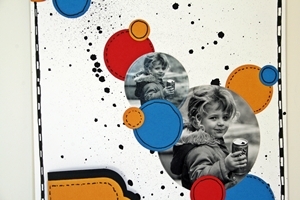 Here is a clever use of circles and Impressabilities to texture the background of a layout. 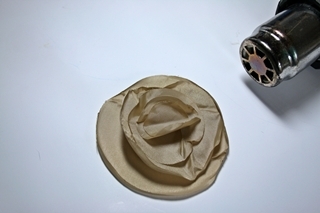 Here is a fantastic tutorial for making a circle flower embellishment. 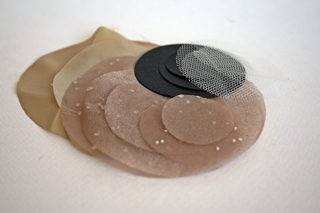 The embellishment was featured last month on a layout. If you missed the layout check it out here. were making this into a brooch, I would leave the Bazzill out. Bazzill. 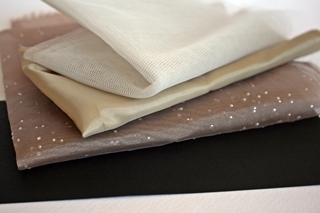 The next step is just for the polyester fabrics. circles. The edges will melt slightly and curl up. Arrange the circles in a pile, alternating colours, fabrics and cardstock. Today we have a layout to share with you. 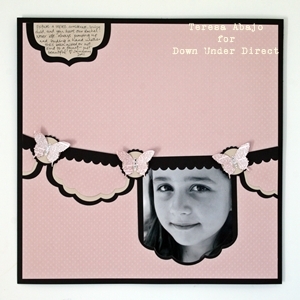 Teresa has used Grand labels Eleven to make a cute little panel that opens up to reveal her journaling. Here is a lovely idea for a mini album and box.
" 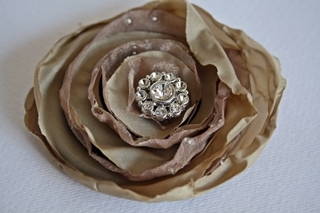 All of the flowers on this little album box were made using Bazzill and the Rose Creations die! 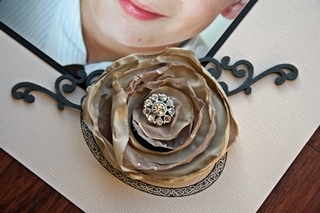 Its amazing how much depth and dimension you can create with these two crafty must-haves!" Today we have a card from Sue. "The gold butterfly is embossed with gold embossing powder then the wings dipped in glitter, apply a little dimensional magic to the body and sprinkle with micro beads and you have a classy little butterfly." Here is a wedding layout from Sheree. "In this card, I combined the square 'Dare to Dream' sentiments with the circle borders from the 'Just a Note' set, to create the cute little circle embellishment. These stamps are really SO versatile and easily mixed and matched!"